This book is from the point of view of five teenagers who have (along with many other people) been quarantined in a mall on account that some kid had found a suspicious item in the air ducts of the mall. Some people are trying to keep their own lives from falling apart rather than saving others. Some were forced to be there and would have much rather been at home. Others were just hanging out with friends having a typical day at the mall. This ‘bomb’ was unfamiliar territory for the local police so the bomb squad and the F.B.I. were all called in, it looked like they were going to be there for a while. At first it was pretty comical being locked in a mall with hundreds of shops and restaurants. After days though it’s no laughing matter. The restaurants have almost completely run out of everything. Enraged rioters have raided stores and shops and everyone is in hysterics. Then the people start getting sick. A hospital has to be set up in an office supply store. Hazmat doctors wheel in two or three patients an hour with al the same symptoms, blue fingers, ears and noses. When the scientists determine what is happening to all these people it is too late. Most of the mall population has been contaminated and even the hazmats can no longer stay to help. This book is one of my most recommended books. It has you on a gruesome and twisted roller coaster from the start. I don’t recommend this book to anyone who is squeamish to medical science. 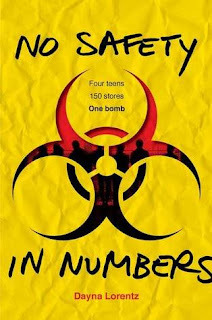 No safety in numbers thrust you into a futuristic atmosphere where our government is dealing with different kinds of terrorists, the kind that knows the human race’s weakness, itself. I recommend not starting this book until close to the end of school because it gets you wrapped up in it and doesn’t give you an ending. The sequel doesn’t come out until July. I'm pretty sure my granddaughter would love this book! Thanks for the review!